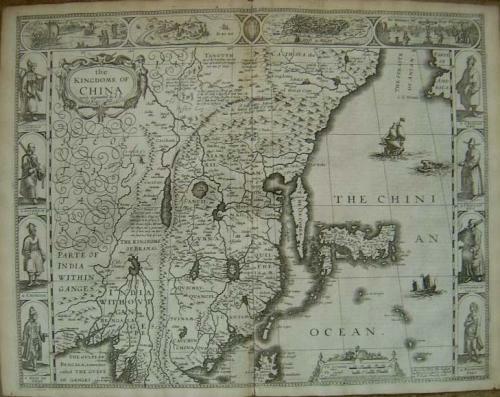 An important map of China by John Speed, London 1676. Published in the Atlas "A PROSPECT OF THE MOST FAMOUS PARTS OF THE WORLD"
With views showing a sailing land craft, manner of execution and city views of Macao and Quinzay and the costumed figures of Chinese, Japanese and Pegu men and women. The map is in good condition except for a centerfold loss of approx 1 cm where it has been cut from the atlas binding. This loss is taken into account in the price.